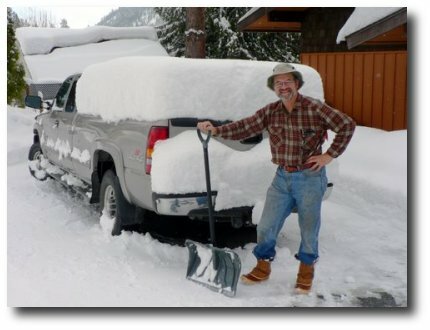 It’s been 10 days since we pulled out of the driveway in Leavenworth WA. A foot of snow still covered the lawn on the day we left. We’ve now traveled 1,810 miles south, and tonight we’re sitting in an RV park only 30 miles above the Mexican border. However, it seems like winter wasn’t ready to give us her leave, and has caught up with us here. Air temps got as low as 44 degrees during the day’s drive, and we passed through several chilly downpours, and a couple of hail storms. The sky island mountains to the southwest are dusted with fresh snow. A raw 20 mph wind is blowing from the northwest. We’re tucked into the boat cabin, with the winter side of the sleeping bag up, and the Wallas stove heater going full blast. We hope this wintry weather blows through quickly. The drive south has gone mostly well. We’re fortunate to have family members strategically positioned about every 450 miles along the route. With layover stops in Klamath Falls OR, Folsom CA, Los Angeles CA, and Chandler AZ, we’ve been enjoying a traveling reunion with close family members. The truck is running very well, and I’ve been averaging 16 mpg, which is remarkable, given the load we’re towing. The trailer, however, has been the occasion of a running series of aggravating problems. Trouble began as a result of the rotten condition of I-5 in the San Joaquin Valley. Extensive stretches of concrete surface are badly fractured, and large chunks have settled an inch or two. These hazards are impossible to dodge, and they really jolted us on many occasions. At a rest area just outside LA I discovered that a weld on one of the trailer fenders had broken. I’ve been in the custom of hooking the tie down strap to the fender bracket, and the jolting had been just too much for the weld. The fender was attached at only one end. I repositioned the strap, and made it to my folks place, where I bolted an aluminum angle brace to the frame to stabilize the fender. While at mom and dads, I attempted to jack the boat off the trailer bunks, one end at a time, so I could apply anti-fouling wax to the hull. 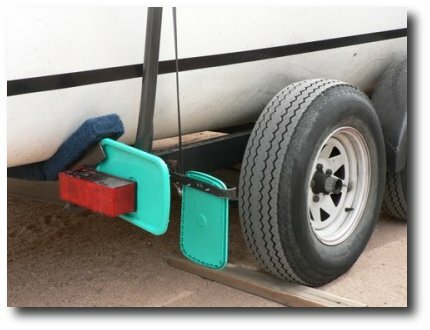 I’ve done this operation before, using the wheel jack at the front of the trailer. However, on this occasion, when I’d nearly lifted the hull free of the trailer, something inside the jack stripped out. I ended up purchasing and installing a bolt-on pivot jack, and finished the wax job with the aid of my truck jack, which I should have used in the first place. Next problem occurred on the drive to Phoenix. We left at 5:30 am to avoid getting stuck in the LA freeway traffic. We stopped for breakfast in Banning. I checked the trailer, and discovered that my aluminum angle bracket had failed, and the fender was once again attached at only one end. To make matters worse, the jagged end had started sawing through the tie down strap. I repositioned the strap and we continued our drive toward Phoenix. About an hour out of Phoenix, I made one of my periodic mirror checks of the trailer, and found myself looking at an exposed tire where my broken fender had once been. The whole thing had broken free. I stopped at the first opportunity, and was relieved to find that no damage had been done to the boat or to the trailer lights when the fender broke free. To top things off, I picked up a nice rock ding in the windshield about 30 miles further on. Upon arriving at my sister’s place in Chandler AZ, I located a windshield repair place and got the ding sealed. By the time I got back to the house, my brother in law had ingeniously fabricated a steel bracket, to which he’d bolted a makeshift mud flap out of a plastic bucket lid. It looks rather crude, but does quite a good job of covering the tire tread from the rear. Hopefully, the cops will not find fault with this setup. I probably won’t be able to do a more complete repair until after we return home. I brought quite a few repair and replacement parts along for this trip, including a spare tiedown strap, but a spare trailer fender wasn’t one of them. Tomorrow, we will cross the border. 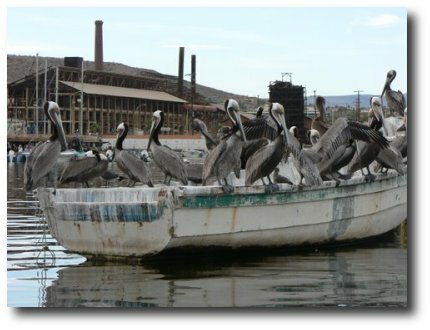 We’ll rise fairly early, fix breakfast in the boat, then drive to the Nogales area. We’ve done lots of homework, and will learn then whether we’ve got it right. Hopefully, by this time tomorrow night, the boat will be floating in a slip at the San Carlos Marina. I awoke around 6 am, and the boat cabin felt like the inside of a deep freeze, which wasn’t surprising, given the 32 degree inside temperature. Outside, the boat and truck were pebbled with frozen rain droplets. The mountains to the southeast were blanketed with snow almost to their base. We fired up the heater/stove and had coffee and cereal in the slowly warming cabin. Then I hitched up and we proceeded toward the border. There was a long line of vehicles cued up on the Mexican side of the border, waiting to reenter the US. As for us, we just drove on across the border without even so much as stopping. About 18 miles beyond, we reached the expected stopping area, where we obtained our tourist permits and boat importation permit. The lines were almost non-existent, and the officials were very friendly and helpful. Some spoke good English, and some rather broken English, but we were well prepared with our documents and copies, and it went well. We then headed south on Sonoran Highway 15. This is a divided 4 lane highway, which, for the most part, has a good driving surface. It’s a bit chuckholed in a few stretches, but nothing like I-5 in Southern California. The most noteworthy thing about this highway is its shoulders, or rather, lack thereof. Along most stretches, there is about a 6 inch drop from pavement to dirt, and then the dirt road base slopes down at a 45 degree slope for about 10 feet. Even though much of the road travels along level terrain, the whole thing seems like mountain driving, with severe consequences if you ever dropped a wheel over the fog line. In the small towns along the way, sharply pitched speed bumps cross the highway. Anything over 5 mph there would be disastrous. The sides of the road are heavily littered, especially in the vicinity of towns. They do have litter barrels at regular intervals, however most are impossible to safely access, due to the lack of shoulders or turnouts. This doesn’t discourage their use, however, since each one has accumulated a great heap of trash, strewn about around its base. My best guess is that the barrels are used as targets, with trash being thrown out as cars drive by. The barrels are mounted on welded frames, and are suspended above the ground. Those that are on turnouts have just as much trash lying around them, and I never saw one overflowing at the top. My best guess is that these barrels lack bottoms, and are used like basketball nets. The trash must be tossed in, and then fall out the bottom. We did see a couple of litter cleanup crews, working along the side of the road. By the looks of things, they are guaranteed an ample supply of work well into the future. We saw a few Federales, and one military checkpoint on the northbound lanes. One car was freshly off the road on our side, with emergency lights flashing, but there was no way I could stop, given the curving location and lack of shoulder. This is a toll road, with 3 toll plazas along the way, which cost us about $7.50 per stop. Roadside shrines occur regularly alongside the route, perhaps marking spots where unfortunate drivers paid the ultimate toll. I worried about getting a flat tire, since it would be impossible to safely stop for many miles, in most places. However, we experienced no problems at all. No flats, no traffic tickets, no wrong turns, and not even a close call. Nonetheless, we were glad to finally reach San Carlos, around 4:30 pm. The temperature had reached a high in the upper 60’s, and a brisk wind was coming in from the west. 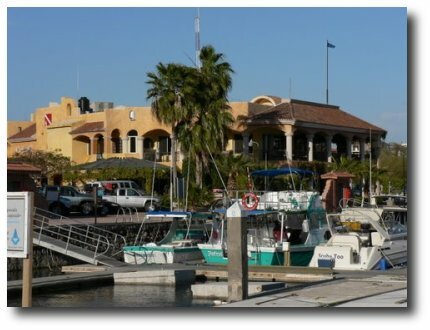 We stopped to fill the boat’s gas tanks at a Pemex station outside town, and then drove over to the marina. By time we got there, they had closed for the day. I met a guy named Peter, who teaches Spanish, and he showed me where things were. He has a friend with secure parking, and he thought his friend could give us a better deal than the marina’s parking. We plan to come back tomorrow morning to launch the boat and get set up. We will stay the night in a slip, if they can accommodate us. We then drove back through town to an RV park we saw in the drive in. We are registered there for tonight. 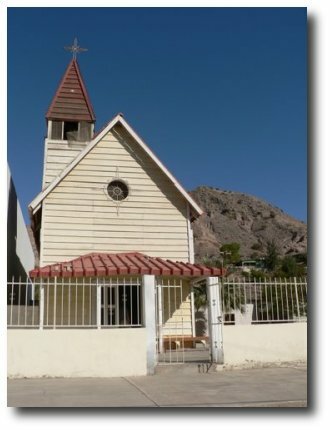 It’s a nice place, very clean and located just across the road from the Sea of Cortez. Once the boat was unhitched and leveled, we walked out to the highway, in search of dinner. We walked by a promising place with a great view of the sea. They had a great steak and shrimp special, with free margerita. A couple of employees standing there by their chalkboard sign invited us in, and we accepted the invitation. We definitely didn’t regret the choice. We sat at an open air table, sheltered from the wind, with a stunning view of the bay. Gulls and pelicans circled out over the water. The drinks and dinner were excellent. Midway through the meal, a Mexican lady with a lovely guitar strolled in and asked us if we’d like her to play a song. We said yes, and she played and sang a lovely romantic song. I handed her a 50 peso note when she had finished, and she seemed pleased with the tip. She later sang at the next table, and had to inform the Americans there that they should pay for her singing. She said the rate was 40 pesos per song. I felt I’d opted for the right amount. We really enjoyed her song, and the warmth which accompanied her singing. The folks at that next table were a lot of fun, though. They were from Philadelphia, and the guy is a bar singer himself. 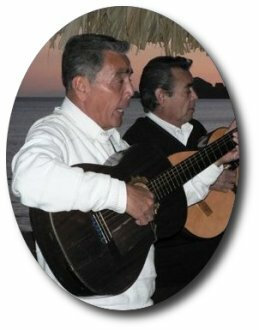 He ended up singing to the Mariachis in a fine tenor voice, while they tried to follow along with their guitars. It being St. Patrick’s Day, he favored Irish ballads. We all got a laugh when one of the Mariachis broke out in a perfect rendition of “Danny Boy”. After dinner, we went for a stroll along the waterfront walk, enjoying the last light of sunset. In the distance we could see the faint outline of the Baja side. Even though it is over 70 miles away, some of the peaks there are 6 to 7 thousand feet high. We look forward to our crossing in a few days. Hopefully, the weather will be suitable by Thursday or Friday. It’s almost 9 pm, and we’re both beat. It’s been a very busy day. 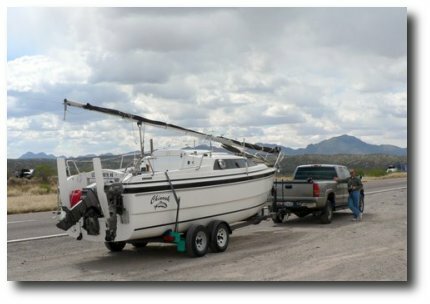 We drove the unhitched truck over to the marina around 7:30 am, to grab some breakfast and see about launching the boat. I scheduled a 10 am sling launch, and then we had breakfast at the boaters’ hangout called Barracuda Bob’s. Food was great, and it was warm enough to sit outside. After breakfast I looked up my new friend Peter, who had confirmed long term parking with his friend Al. Al agreed to meet me at the marina tomorrow at 11:30 so I could follow him to his parking facility. Then we drove over to the nearby market and bought seven 5 gallon jugs of purified water. I hauled them back to the boat, which we’d left at the RV park, and filled the drinking water tanks. The water cost 14 pesos per gallon, but the deposit on the jugs was 50 pesos per jug. We returned the jugs and then went back for the boat. We hitched up and got to the marina right at 10 am. After tending to the paperwork, they did a fine job slinging the boat into the water. Chinook was finally in contact with the Sea of Cortez. We climbed aboard, lowered rudders and partial centerboard, started the 50 hp and putted over to our slip. Then began the work. We hauled gear down from the truck, and started rigging. While we were at this task a Macgregor Classic pulled into the slip next to ours. She belongs to Rich, who happens to be a member of the Tuscon Sailors Club, and a heck of a nice guy. 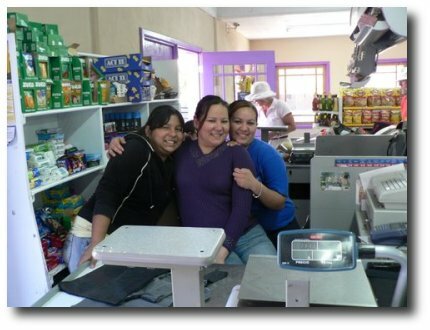 He ended up accompanying us on a grocery trip to the big store in Guaymas. After shopping we all went out to dinner and swapped sailing stories. It was a fine time. After dinner it was back to the boat and more work. I worked at finishing rigging and attaching gear topside while Sandy packaged and stowed groceries. We were both worn out by the time we reached a stopping point. We’ve gotten lots done today, and hopefully can wrap up tomorrow morning with time available for showers. I’d like to pull out of the marina around 1 pm, and maybe head over to Martini Cove, which is just a short ways north of the marina. We rose to a lovely morning. We ate a breakfast of muffins and coffee in the cockpit. 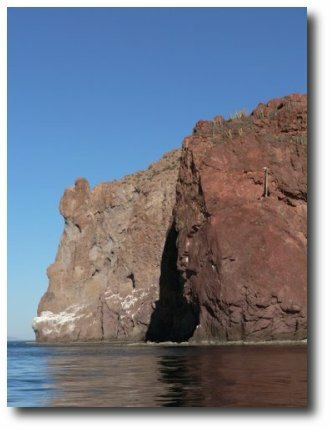 While enjoying the colors of sunlight on the red rock cliffs around the marina, I spotted an interesting looking gull. I got the bird book out, and while looking it up, one of the brown pelicans which regularly patrol the marina dove on a fish. He smacked the water about 3 feet to my left, and totally drenched me, my coffee mug, and bird book with his splash. After breakfast we finished prepping the boat for our cruise. I rinsed the road dust off with Rich’s dock hose and filled the porta-potty and solar shower. Sandy and I both showered at the marina bathhouse. One major task was trying to get the Wallas stove working. It ran for us on the drive down, but at our last stop, just north of Nogales, it failed to light. The red starter light just blinked when I turned it on. The manual said that behavior indicated low voltage. I checked the power connection, the in line fuse, and the connection to the panel. All were good, and it still failed to start. I got out the ScanMarine card, where we bought the unit. Rich loaned me his cell phone, since ours isn’t set on the right plan for here. I got a call through to Mike at ScanMarine first try. I described the problem and he said he was confident that the wire connection between the blower hood and the stove was the cause. I thanked him, hung up, and checked that wire. Sure enough, the black wire had come loose. Nearly impossible to spot unless you’re specifically looking for it. I scored big time points with Sandy for fixing the stove. Thanks Mike of ScanMarine for helping me look good. Around 11 am I went over to the marina office and hitched the empty trailer to the truck. I’d arranged to meet Al of Al’s Mini Storage there at 11:30. We met and I followed him out to his storage facility, about 3 miles from the marina. He’s a neat guy, about my age, and has a small fenced yard with barbed wire on top and a watchdog on patrol. He lives directly across the street, so I feel very good about leaving the truck there. He even thought he could install a new fender on the trailer while we’re out. He gave me a ride back to the marina, and after lunch we made ready to depart. The calm morning had given way to a stiffening breeze which was whipping through the marina. Yesterday afternoon it had built to a very gusty wind. I was counting on today’s weather to be a little lighter. We left our slip around 2 pm, and followed the narrow, twisting channel out of San Carlos Bay. My destination was Martini Cove, just a short distance away. We wanted to be clear of the marina, which was rather noisy last night, and get started on our cruise. We’re both glad we made this move. Martini Cove is a lovely spot, just 2 nm from the marina, but completely screened from view. There are no houses nearby, and only the lights of Guaymas, many miles away across the Bay, hint of civilization. We anchored in the cove, sharing it with a few dive boats which use the area for dive training. It’s dark now, and all have left except us – just like Cunningham’s cruise guide book said. The shoreline is rugged and heavily vegetated with cactus. There are lots of pelicans, gulls, and the occasional frigate bird. The northwest wind which was present when we anchored shifted to a very gusty land breeze by late afternoon. It appeared that we were dragging, so we reset the anchor. When I got it up I discovered a boulder about the size of a small watermelon hooked in the Bruce claw. The gusts reached a measured 18.5 knots, which was amazing since we were only a hundred yards from shore, and the land looked to offer protection. I think they call this type of gusty afternoon land breeze a chubasco around here. Tomorrow we’ll head up the coast about 15 miles, to Bahia San Pedro, and hang out there for dinner. If conditions are good, and the forecast is favorable, we’ll begin our crossing after dinner. It’s late afternoon. We’re swinging at anchor in Bahia San Pedro, a nice sheltered spot comfortably away from the buzz of San Carlos. We’re sharing the spot with a half dozen boats, both power and sail. They are undoubtedly the quietest, most laid back bunch of cruisers I’ve ever encountered. This is a very good thing, too. I’ve been fighting a cold I picked up while visiting relatives during the drive down, and I didn’t sleep well last night. 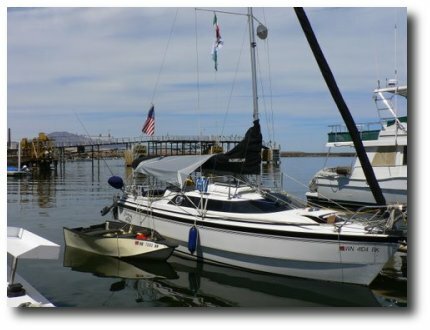 Around 6 pm this evening we’ll raise anchor and make our moonlight, overnight passage across to Santa Rosalia, on the Baja side. With temperatures in the low 70’s, a light cooling breeze breathing across the bay, a completely calm sea, and the loudest sound being the water lapping up on the gravel beach, conditions were perfect for a couple catch up naps, and we both took full advantage. The run up here from Martini Cove was most pleasant. The 50 hp purred smoothly, and I really love the feel of the new steering I installed last winter. This side trip up the coast wasn’t necessary for our route, but I thought it would serve well as a shakedown cruise, since I hadn’t had a chance to run the boat before we left home. So far, all systems are go. The new solar panel and Engel 35 frig are both working out well. When I got up this morning, the internal frig temp was 37, and the house batteries were sitting at 12.68 volts. If this keeps up, we should have no problems supporting the frig and other electrical draws, even when we hit warmer weather. I dragged a fishing lure behind us on the run up to here, but had no luck. I don’t think I’ll bother putting a line out during the crossing. I’ve rigged a jack line from the cockpit to the bow, on the port side, and whoever is running the boat will wear both lifejacket and safety harness, clipped to the line, during the crossing. I had planned on motor sailing with the main, but given the total lack of wind today, I don’t think there will be any point in raising the sail. We’ll need to dress warmly, since the night time temps have been in the high 50’s, and we will have at least 6 knots of apparent wind, given our planned cruising speed. I have a spotlight plugged in and ready for use, and we’ll wear headlamps to see things near at hand. However, given the fact that we’re one day shy of a full moon, and the skies will be clear, I expect the visibility to be excellent. I think a 70 nm crossing, on calm seas and pleasant temperatures, under a bright moon will be an experience to remember. I’ll take the first watch, a long one, while Sandy catches some sleep below. Between 11pm and midnight, depending on how I’m feeling, I’ll wake her so I can take a break. I’ll try to snooze in the cockpit, and then, after 2 or 3 hours, take over again. At least that’s the plan. Well, dinner is almost ready, so I’ll sign off for now. We raised anchor and departed Bahia San Pedro at 6:20 pm, just as the sun was setting, and the full moon rising. The sunset projected pastel shades on the rippling sea as we headed for the north end of San Pedro Island, some 7 miles distant. In the failing light we spotted a pair of whales, about a half mile off. By the time we reached San Pedro Island night had settled in. I took the first watch, and steered the boat by the light of the full moon until midnight. I ran at 2100 rpm, averaging very nearly 6 knots. There was no need for motoring faster, as I didn’t want to arrive at Santa Rosalia prior to sunrise. The night air was quite chilly, and I wished I’d dressed a bit more warmly. Sandy took over from midnight until 2:30 pm, which gave me time to warm up and nap a bit. I completed the run into Santa Rosalia, after her watch. You begin to see the lights of Santa Rosalia from about 30 miles out. For hours I motored toward those lights. It seemed like we were never going to get there. We got in at 7 am, just after the moon had set and the sun had risen. It was dead flat the whole way across. I’m told it was the calmest weather they’ve had to date this year. We’re now tucked into a slip at the new Singlar Mar de Cortes marina in Santa Rosalia. 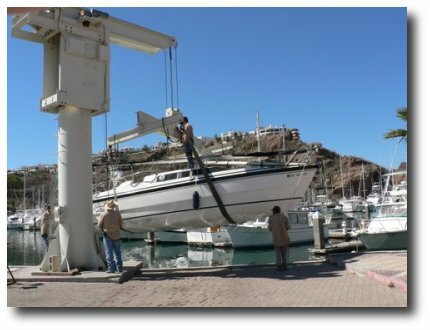 It is a brand new facility, built by the Mexican government to try encouraging cruising boat traffic in this area. It hasn’t taken off yet, judging by the lack of boats in the marina. I hope their efforts succeed. We will be hanging out here for the next several days, before starting our gunkholing explore of Baja as far as La Paz. Layover day in Santa Rosalia. 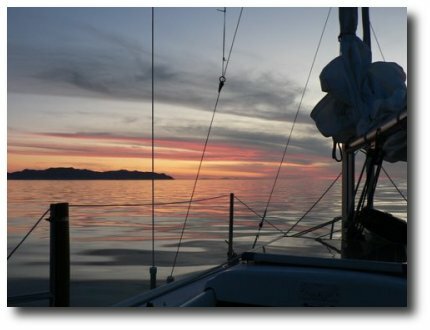 A breeze came up in the middle of the night, and I realized I’d forgotten to bungee the halyards to the shrouds, and they were slapping the mast. I got up and secured them. 2 am, and the pelicans were still diving on fish in the marina. I heard Howard in the next slip over listening to a cruisers net on his ham radio. I asked him for the frequency and was pleased to be able to tune it in on my portable SSB receiver set. If I can continue to hear this broadcast, we will have good access to weather reports. After breakfast I tore into the king berth storage area, and reorganized things. Much better now. 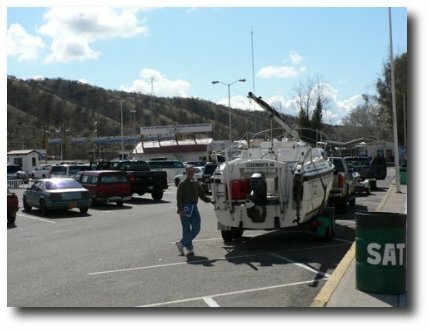 We walked into town with friends from 2 other boats, and did some grocery shopping. While I was waiting near the checkout counter, the young woman at the register gave me a coy smile, followed by an unmistakable fluttering of eyelashes. I thought, wow, 60 years old and I’ve still got it. Then she shyly pointed toward my left shoulder and fluttered her eyelashes some more. Then it hit me. She wanted me to take her picture. As I got the camera ready, she grabbed 2 of her women coworkers, and as I aimed the camera, they hugged close together with 3 lovely smiles. I showed them the picture, and they all laughed and thoroughly enjoyed the moment. After shopping we all went out to lunch, and had a great time telling stories. I noticed a guy at a nearby table who had a Plain Washington shirt on. I talked with him, and sure enough, he and his wife live only 15 miles from our home. Small world. Back at the boat we stowed the groceries, and Sandy went up to do laundry. I got the hose out and rinsed salt off the boat. The folks in the slip immediately next to us had returned from fishing, and he again had landed a beautiful yellowtail, about 25 pounds, and a small, totally crimson red fish. I’ve never seen anything like it. He most generously gave me one of his special jigs, and passed on advice on fishing for yellowtail. He said I needed at least 30 lb test line, tied directly to the jig. Yellowtail are incredibly strong fish, which can run up to 50 lbs in size. They’re real battlers. I hope I get the chance to tangle with one. 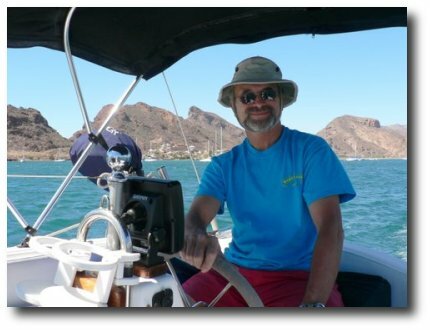 I helped Rich get clear of the dock with his 50 foot long triple masted aluminum sailboat. It was very difficult, since a fairly strong breeze had him pinned to the dock. He ended up running a line across to the upwind slip and winching his boat off the dock, so we could manually ease her back. Once in that position, he was able to motor free. His boat weighs 55,000 pounds, so such operations can be really challenging. Both Sandy and I took showers in the beautiful new facilities this afternoon. We couldn’t shower yesterday because there was no hot water. We were told that they were out of propane, but that delivery would be today, and they would have hot water this afternoon. By mid afternoon the water was still cool. We later learned that the story here last year was also that the water would be hot manana. Oh well, the showers are beautiful, with nice local tile, and spotless. The cold showers were most bracing. Clear skies this morning, but breezy. We had breakfast in the cockpit, enjoying the sweet rolls we purchased yesterday at the Boleo Bakery . Excellent. Around 8:15 we strolled into town and up to the church. The doors were open, but it didn’t look like 9 am was the likely start time. We asked, and learned that the mass would begin at 10 am. We spent the extra time walking around town. One shop had a sign saying “English spoken here” so we popped in and enjoyed conversation with the lady there. We wandered further up town, and found ourselves standing in front of a narrow, old wooden church. While admiring the weathered architecture I heard a voice behind me. This short, old man with a very weathered face was attempting to explain something to me about the building. Despite the language barrier, I began picking up bits and pieces. He wanted to tell me about the mining history of the area. I asked him if he’d worked in the mines and he said “No”. Rather, he had been a heavy equipment operator. He also communicated, with the aid of pantomime, a funny story from his youth. He used to sit on one side of the ravine where the town is located, and shoot at latrines across on the other side. He also indicated that his father had whipped his backside for this behavior. It’s amazing how communication becomes possible, despite a language barrier, when someone wants to tell you his story. 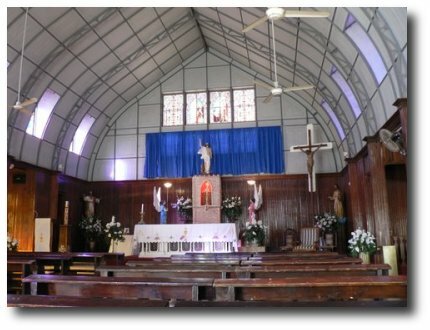 The church service was a wonderful experience. We were the only norte americanos present. About 15 minutes before the start, a short little man who reminded me very much of an elderly Anthony Quinn, range the church bells. He had a definite style and rythem, pulling the two bell ropes in alternating cadence. Music was provided by a pair of guitars and a tamborine, and a choir of 6 women, and they were both enthusiastic and excellent. The priest was a tall, husky Mexican man, who displayed a friendly smile throughout the mass. He was an impressive orator, and I wish I could have understood the homily. The mass was very well attended, with a number of worshippers standing along the sides. We felt warmly welcomed there. After church we returned to the boat. I refilled the main boat tanks from my jerry cans, using a siphon hose with a brass fitting on one end. A few quick shakes gets the siphon action going, and it’s a very effective way to transfer gas into the main 12 gallon tanks, through the access panels installed in the cockpit seats. I was able to calculate that we had used 12 gallons thus far on the trip, averaging 7 mpg while exclusively motoring. That was at 2100 rpm, and no dinghy trailing behind. Mileage will probably decline from here on, since I now have the dinghy in the water. I toted the empty jerry cans up to the Pemex station across the road from the marina, and got them refilled. Gas here is just under $3/gallon. Meanwhile, Sandy was putting a fruit salad together for the potluck being organized by one of our power boat neighbors. 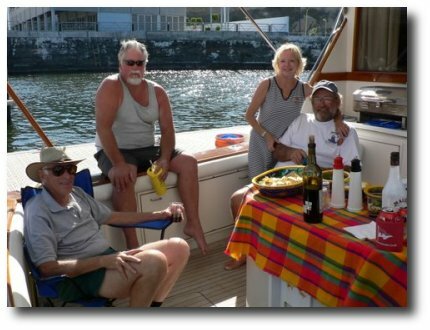 We gathered on the aft deck of a lovely 50 footer and had a delightful afternoon. It’s been breezy all day, and outside the marina the Sea has been nothing but whitecaps. We wanted to leave tomorrow morning, so I could try yellowtail fishing off the north end of San Marco Island, but I’m now thinking it will be better to hang out here a day longer. The weather is supposed to settle tomorrow, and given a little time, the swells should subside. Tuesday will definitely be a better day for fishing. Last evening we decided that, if the weather forecast was favorable, we’d depart manana. I think I’m starting to settle into the lifestyle down here. It’s a day later, and we may leave manana. We got up at sunrise and listened to the SSB net weather report while enjoying a comfortable breakfast. 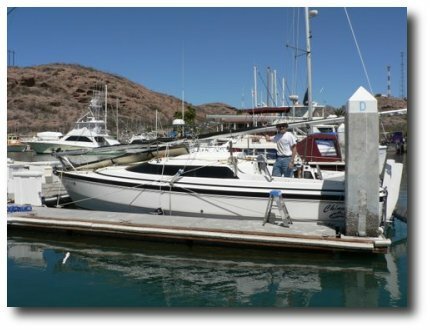 Forecast for today on the Sea of Cortez was for flat conditions all day, and in fact for the next week. 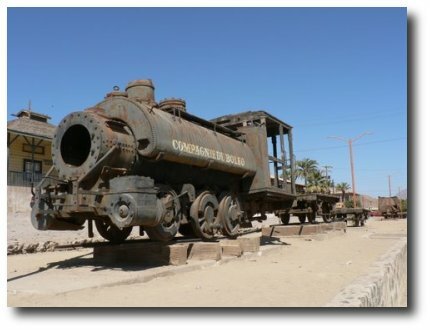 We decided to take our time, walk into town to post some mail at the post office, visit the mining museum, grab one last shower, hopefully this time with hot water, and then pull out after lunch. The museum was highly interesting, with old photographs, 19th century mining equipment, old office machines and other artifacts nicely displayed. Some of the information plaques were in English, but we were able to get the gist of things on many that were just in Spanish. A final note about showers. When we first arrived, we were told by Carlos that there was no how water because of a lack of propane, but that delivery would occur on Saturday. Well, Saturday came and went, and no hot water. Last night Carlos came in to apologize. The propane company ended up taking the whole Easter weekend off, but he assured us that delivery would occur Monday morning. As we walked into town we spied the propane truck in front of the marina, preparing to deliver. Hurray! After our walk, Sandy grabbed her shower stuff and confidently strolled up the ramp. I worked on getting the boat ready to go. A while later she returned, all rinsed and refreshed, with another cold water shower. I’m sure they got delivery of propane, but somehow that didn’t translate into hot water. Who knows. Around 1:30 we were ready to go. However, a wind had come up by then, and the sea outside the breakwater was solid whitecaps. We decided to give it a try, and eased out into open water. The seas were 4 to 5 feet, very closely spaced and steep faced. The direction we needed to head would have put us parallel to the troughs. We easily decided that moving was a poor idea. We retreated to our slip and enjoyed a nice afternoon in the marina. Sandy fixed up a delicious chicken fajita dinner, and we went for an after dinner stroll along the waterfront promenade. It was nearly dark by the time we got back to the marina. 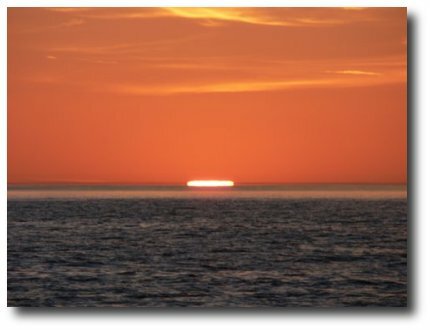 Looking out, beyond the breakwater we could see dozens of points of light, lined up about halfway to the horizon. We were seeing the white running lights of pangas, those small, open Mexican fishing boats, perhaps out jigging for Humboldt squid. The weather tomorrow is supposed to be calm, and we plan to start early, and hopefully do some fishing around San Marcos Island. 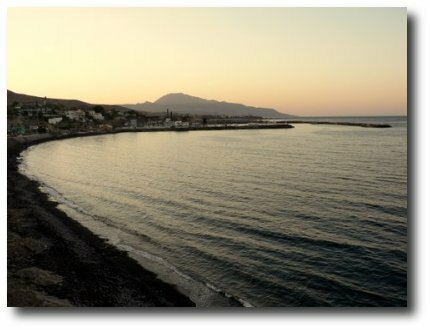 We arrived in Santa Rosalia 5 days ago, with the rising sun, and so today we departed. We rose at 6 am to the sound of big gas inboards rumbling as they warmed up. Our friends of the past several days were heading out to fish. We took our time and ate our oatmeal before leaving the dock. After our abortive foray out of the marina yesterday, I was concerned with the steady breeze blowing off the land and through the marina. However, Irving on one of the sportfishing boats radioed in that it was quite calm a short ways out. We left the slip at 7 am, and had a ringside seat to a great sunrise (at my age every sunrise I see is great). I trolled a lure as we motored the 7 miles across to San Marcos Island. On the way there, we were entertained by a small group of sea lions who were launching themselves completely free of the water in a series of spectacular leaps. A small fleet of open fishing boats were trying their luck over the reef which extends out past the north end of the island. Our friends on Tuna Time were there as well. We heard them radio Irving on the Betty B. Both boats were landing a few cabrilla. I jigged the lure Irving gave me, and managed to bring up a couple fish, only about a pound each. Not exactly the 25 lb yellowfin I was hoping for, but at least we’ve got fishscales on the boat and the prospect of a fish fry for dinner some evening soon. A little before noon I brought my line in, and we motored around the west shore of the island, to a spot called Sweetpea Cove. 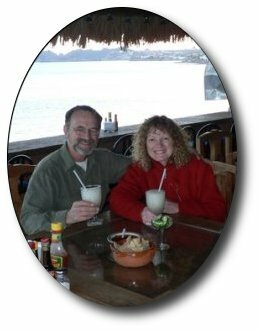 We anchored near a Mexican fishing camp and had lunch. While I was on the foredeck preparing to lower the anchor, a pelican paddled his way toward our boat. We realized that he had his sights on the fish which I had suspended in the water from a rope tied to the railing. We noticed that the poor bird had a broken wing. However, I wasn’t about to surrender my fish to him, but we did quite a dance with him before getting properly hooked. After lunch a breeze came up, and I decided to set the sails for the first time on the trip and move down to the south end of the island. While we were getting underway we saw our first sea bird/dolphin feeding frenzy. About a quarter mile out the surface of the sea was being thrashed from above and below. A pod of several dozen dolphin were tearing into a large mass of baitfish. Overhead, squadrons of boobies would circle and plunge in their stiletto dives, piercing the water like spears. I’d seen such displays on TV nature programs, but had never witnessed the scene in person. It was a remarkable sight. As we neared the south end of the island we could see the huge gypsum mine which dominates the landscape there. A community of about 650 people live next to the mine and, from what we could see, must live a very dusty, dirty existence. Any amount of wind raises clouds of dust throughout the area. We opted to keep on going, since the wind was now out of the southeast and right on our nose. We entered Craig Channel, and figured on anchoring on whichever side of Punta Chivato seemed to offer the most shelter. 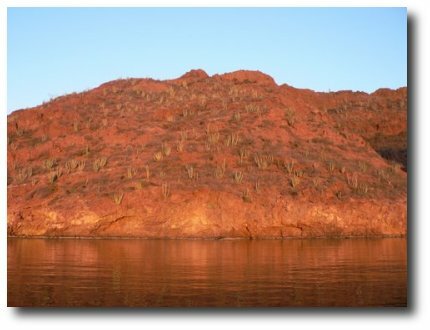 On the way down channel, Sandy glassed the arid shoreline, and remarked at the dense forest of saguaro cactus which was growing a short distance beyond the beach. We decided to go ashore and check it out. We got to within 100 yards of shore, found a sandy patch of bottom, and anchored in about 8 feet of water. The beach was heavily littered with shells, many of which were different from any we’d seen elsewhere. We walked a short way inland to view the cactus varieties which grew there, and then returned to the beach and gathered shells as we walked back to the dinghy. By this time it was after 5 pm, and was time to find shelter for the night. 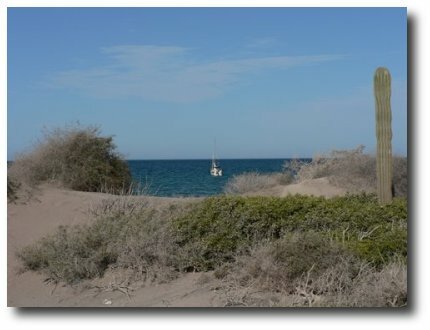 Punta Chivato is a good place, with anchoring options for both north and south winds. However, the sea breeze conditions we had this afternoon brought us both wind and swell out of the east. I decided that the anchorage south of the point would be best, and we made for it. We got here at 7 pm, coming in with navigation lights switched on. It was virtually dark by the time I set the anchor. The wind has died, and we’re in about 8 feet, right in front of a $300 – $800US / night luxury hotel. We have residual swells refracting around our protecting point, so we’re occasionally getting rocked a bit sharply. I’m expecting this to settle down as the night proceeds. We had a late dinner of chicken fajita on Mexican rolls, with fruit salad on the side. Gourmet fare, for sure.